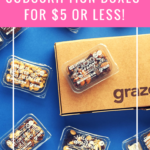 Check out the latest Bless Box Coupons on My Subscription Addiction! Bless Box Coupon – 20% Off Subscriptions! Bless Box Deal – Surprise Box + Hot Cocoa Essentials for $19.99! Bless Box Coupon – Free Bonus Box With Subscription! Bless Box Coupon – Free Makeup Bag + Skinn Eye Palette + 25% Off Your First Box! Bless Box Coupon – First Box for $19.99!